Goody bag filled with Gardetto snack mix. 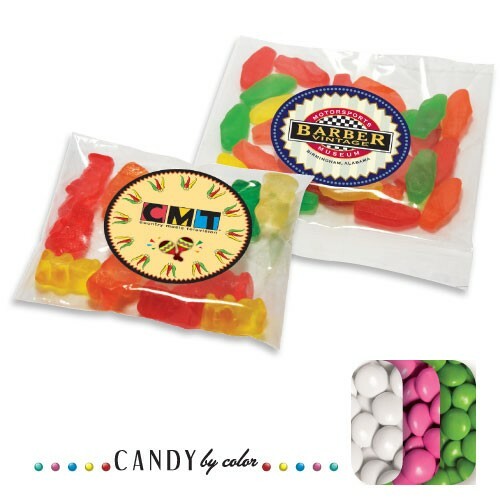 Perfect for parades, tradeshows or any event where you want to given an inexpensive, colorful and delicious treat. The round label includes a full color, full bleed imprint. Dimensions: 3" x 4". Bag contains approx. 1 oz (28g). Non-melt product. • See Options Tab for Additional Imprint Options and Pricing. • See Options Tab for Confection Color/Flavor Choices. • Shelf-life: Our Kosher Certified Premium Swiss Chocolate and Confection products have a shelf-life of one year if properly stored at room temperature.